Simply an egg baked in some fried tomatoes and spices. This is another abitmoreveg recipe. At the time I came up with this I was not aware that baked egg in a hot tomato sauce was actually already thing (believe it or not, when I first made a cake with ground almonds I thought I had discovered something entirely new – we discover things when we discover them, ok?) 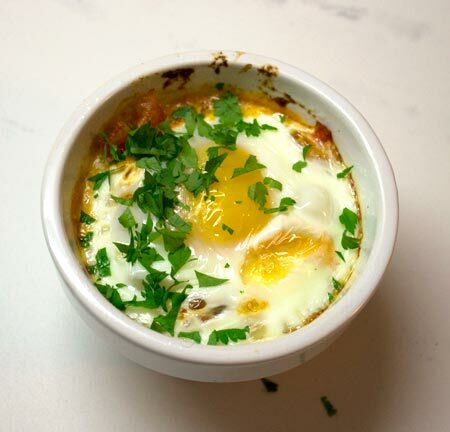 – here is a link to a video of how to make proper Shakshuka. This little recipe is still good. I actually haven’t made it since finding out about Shakshuka – mainly because I want to try and make Shakshuka instead but haven’t got around to it yet. 2017 – a new year. Hopefully. Are you a morning person? Do you hop out of bed full of joy and energy ready to greet whatever the world has to offer you? I’m not and I don’t. I often walk into the door frame of the kitchen door as I wander bleary-eyed over to the coffee machine. Not a morning person. At all. This is a great breakfast for us not-morning-people. Not only is it very tasty but the little kick of chilli in it gives you that bit of pep you need to start the day. Naturally it’s healthy too. Eggs are good for you as are tomatoes, garlic, onion and chilli. But the real reason to make it for breakfast is that it’s simple and delicious. I loved this. Even more than I love the Egg and Avocado Bake (I’ll post it tomorrow), which I also love. It’s not just the taste it’s the peppiness too. Anyway, try it and I hope you like it as much as I do. Tomato, egg, cayenne pepper, garlic clove, onion, red wine vinegar, oregano, salt and brown sugar. Heat the oven to 200 C.
Peel the onion and garlic clove, chop roughly and put in blender. Top, tail and deseed the cayenne pepper, chop roughly and add this to blender also. Whizz till everything is chopped small. Should take less than a minute. Heat a little oil in a frying pan and fry the chilli, garlic and onion on a high heat for a minute or two. Keep stirring so that they don't burn. Chop the tomato into small pieces and add to the pan. Add a small splash of red wine vinegar. Sprinkle over the oregano, salt and sugar and keep stirring until the tomato has softened. Taste and add more salt or sugar if necessary. Grease a ramekin, spoon in the hot tomato and crack and egg into it. Place in the middle of the heated oven and bake at 200 C for 10 - 15 minutes. Take out of the oven and sprinkle over a little parsley or coriander. Having whizzed the garlic, onion and chilli in the blender, fry it quickly on a high heat. Then add the chopped tomato, continue stirring till the tomato softens. It’s now ready to spoon into a ramekin. Spoon your hot tomato into a greased oven-safe ramekin, break in an egg and bake in a pre-heated oven at 200 C for 10-15 minutes. Take it out, leave to cool for a minute or two and then sprinkle over some herbs, like coriander or parsley. Place on a pretty plate – and d’ya know, it doesn’t look half bad. Tastes good too.